Thinking back to barely a year ago, Oscar Vasquez says things have changed on the Oxnard, California farm where he works picking strawberries. For so long, he felt as though he was treated like little more than a cog in the fruit production machine—necessary to his employer, but also very replaceable. The Oxnard farm is one of several pilot sites for a new project called the Equitable Food Initiative, or EFI, which is a collaboration of some unlikely bedfellows: industry players like Costco, worker advocacy groups and unions like United Farm Workers (UFW), and humanitarian organizations like Oxfam (see the full list here). The goal is to create a certification system for farms that will help transform fruit and vegetable production into a business that’s safer—for consumers and workers alike—and a little more more fair for workers. The Initiative has created a certification scheme, and covers three main areas: labor, food safety, and the environment. The certification requires a farm to comply with a long list of rules, finalized last June, but what it adds up to, says Peter O’Driscoll, EFI’s project director, is more than a few procedural changes. He also sees a difference in safety practices related to pesticides, a huge concern for farmworkers. Without adequate training on how to use them safely, workers face continuous exposure to chemicals that are hazardous and often have long-term health impacts, like cancer and birth defects. Vasquez says that while most workers know to avoid fields that have recently been sprayed, it isn’t always clear when they have been. Now, on the farm where he works, there are signs workers can put up to alert one another after spraying. The goal of EFI, ultimately, is to turn farms into more dignified workplaces, and, by doing so, increase the quality of the goods they produce—which is why it makes business sense for companies to participate, too. Any company growing or selling fresh produce can participate, but it’s tailored for larger farms. In addition to any investments they need to make to come into compliance with EFI—building better pesticide storage, for example, or paying workers more—participating farms must pay about $25,000 in fees for third-party audits and leadership training for farmworkers. So, because the expenses are significant and the required changes are potentially costly, cumbersome, and time-consuming, it’s likely that larger farms will be the most interested in the program. They also have more workers to make it worthwhile, and stand to gain the most from any reputation gains. When you buy apples at a supermarket, barely a fraction of what you pay for goes back to the farmworkers who picked them. And their pay depends on the amount of produce they pick—so the goal is to work fast. What that means isn’t just a low wage, it also means the inability to stay home if you’re sick. There’s also no incentive—and often there are no means—to wash your hands after eating lunch or after going to the bathroom. These routine food safety steps aren’t often practiced because they slow a worker down, which cuts into their paycheck. Organizations already advocating for farmworkers’ rights realized a few years ago that safety might be the foundation for some common ground between workers and companies. So a coalition sprouted between the advocacy organizations who wanted to see changes in working conditions on farms and retailers who would love to avoid more recalls. EFI now has Costco and Bon Appétit Management Company (BAMCO)–a major national food service company with a track record for high labor standards–on board and is currently in talks with several other international companies. That doesn’t mean every fruit and vegetable Costco and BAMCO sell is EFI-certified, however. (With EFI still in a pilot phase, there’s not nearly enough produce.) But what it does mean is that Costco recognizes the value of EFI certification, and is willing to work with—and probably pay higher prices for—suppliers that take on the certification. Lyons says that Costco isn’t going to pass the costs onto customers, “so we’ve got to eat it in our cost structure.” Without large clients like Costco on board, there’s almost no way for farms to recoup those costs. So while it’s up to individual farms to get certified, it’s up to the major retailers who buy the farms’ produce to help make it financially feasible to do so. And now, it’s making a difference for people like Vasquez. While these things were available some of the time before EFI, they were unreliable. With EFI comes a long list of detailed criteria (pdf) that includes things like better pay, rest areas and rest periods to avoid heat-related illnesses. All mixing of pesticides occurs in a well-ventilated area and workers handling certain classes of pesticides are medically monitored. The hope is that that higher bar will create a win-win-win situation for retailers, consumers, and farmworkers. After piloting on three farms, EFI hopes to work with 40 farms by the end of 2014, and 400 by 2017. The plan is to develop a consumer label to distinguish EFI-certified products from others, but it’s unclear when that might start showing up in stores. “We are looking for farmworkers to take responsibility for the integrity of the food we eat and that is a profoundly affirming thing,” says Nicholson. Photo at top by Richard Thornton. 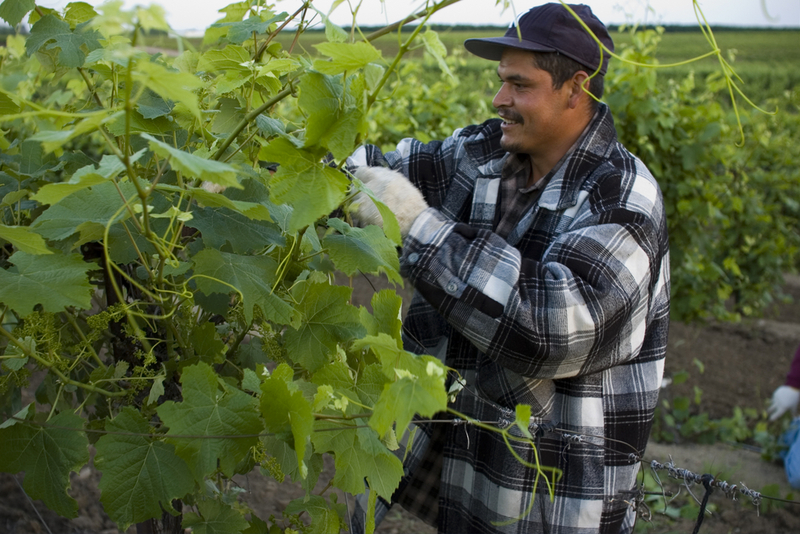 Second and third photos of farmworkers courtesy of Oxfam.